PT Yodya Karya (Persero) - Yodya Karya or known as YOKA is reputable state-owned company in Indonesia, based in Jakarta and engaged in engineering consultant. 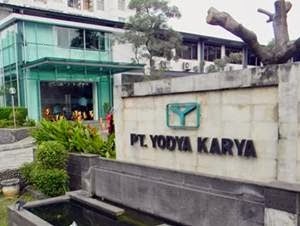 PT Yodya Karya (Persero) is a State-Owned Enterprise (SOE) in the form of Limited Liability Company in which all shares are owned by the Republic of Indonesia. Yodya Karya has core business focus on construction and non construction industry. Its business include consultant planner services, including architects, engineering and management consultant services. PT Yodya Karya (Persero) was first established in 1948 as a Dutch company named Naamloze Vennootschap Job en Sprey (NV Job & Sprey). In 1958, NV Job & Sprey was officially nationalized by the Government of Indonesia under the name of PN Yodya Karya. The name PT Yodya Karya (Persero) officially launched in 1972. Yodya Karya now has 7 regional offices, 7 branch offices and also supported by 4 division units, namely Infrastructure Division, Engineering Division, Building Division, and Asset Development Division. In term of financial performance, Yodya Karya was able to perform well and achieved encouraging results of operations in 2016. According to information found in PT Yodya Karya (Persero) Annual Report 2016 as cited by JobsCDC.com, Yodya Karya managed to recorded total contract value of Rp 477.43 billion in 2016. This reflected an 7.46 increase from Rp 444.27 billion in 2015. Referring to its annual report, total net profit for the year achieved Rp 21.52 billion, that was 40.60% higher than Rp 15.31 billion total net profit for the year booked in 2015. S1 Civil Engineering or Architecture. Minimum GPA of 3.00 (PTN) and 3.25 (PTS). Possess expertise certification (SKA) Ahli K3 Konstruksi is preferred. Have a strong working and study motivation. Willing to be placed throughout the work area of PT Yodya Karya (Persero). JobsCDC.com now available on android device. Download now on Google Play here. Please be aware of recruitment fraud. The entire stage of this selection process is free of charge. PT Yodya Karya (Persero) - K3 Construction Expert Staff Yodya Karya June 2018 will never ask for fees or upfront payments for any purposes during the recruitment process such as transportation and accommodation.